Hello everyone, today is my Gotcha Day, do you want to help me celebrate? I’m celebrating my Gotcha Day on our new Halloween scratcher which is smack dab in the middle of a grand sunpuddle. For those who are new to our blog, please realize the power of social media when it comes to helping critters in need. When you see a post that someone asks you to share it’s really important, that was the case with me, I was gotcha’d thanks to the power of social media, specifically Twitter and someone sharing a post about me. If you’re new, you might want to take a minute to check out the two posts that started it all…Not on My Watch: Dilute Cali Caught in the Middle and Not on My Watch: More about the Dilute Kitty. It just so happened that I was at our Vet, who was not our Vet at the time, Dr. Anderson from the Cat Clinic. Oh, and remember Jenna, our rescue pal? Yes, she is the one who saved me and that’s how we all met Jenna. I was front paw declawed, dumped in a bad part of town during a week of pouring rain, and ate bugs for a week to survive. Jenna mounted a rescue effort and hunted for me day and night for a week until I gave in and got captured. We are so glad Dolly, that you were found and saved. You couldn’t have found a better home. You all have a fantastic day. Happy gotcha day. Sharing the posts is important indeed. Happy Gotcha Day Dolly!!! You must have been so scared when you were dumped, but you have a wonderful family now and will never have to eat bugs again unless you want to. Happy Gotcha Day. So glad you have a wonderful home now. Happy Gotcha Day Sister Dolly! That is an amazing gotcha story, my eyes are getting all watery. Your Dad and Jenna are heroes, real life heroes – paws up to them both! I’m glad you were rescued and have the best forever home. A Gotcha Day on Caturday can’t be beat! Happy Gotcha Day Sister Dolly!!! 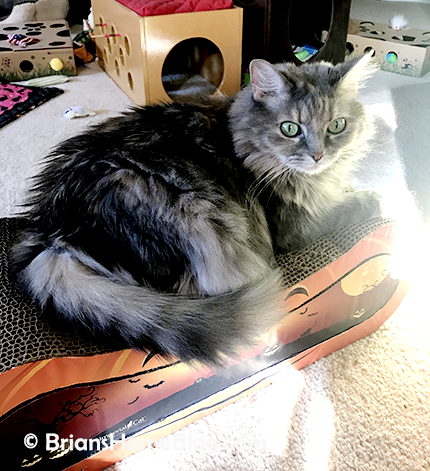 We love that you are spending it on your Halloween scratcher and with a wonderful sun puddle shining on you. Hope you enjoy your day filled with love and delicious treats. So happy you are living in such a wonderful furever home. Thanks for the share. Have a fun time today. Congratulations on your Gotcha Day! That looks like a great scratcher! Happy Gotcha Day sweet Dolly!!! Oh Sister Dolly I wish you the very BEST of the BEST of Gotchas. Your story had a happy ending and we wish everyone’s did – you were so lucky because you were saved from a sad fate. If only everyone would HELP maybe more could find their true forever. Have a special day dear girl. Hello Dolly and happy Gotcha day OMCs if your eyes get any prettier I don’t know what I will do. Sister Dolly, you are so fortunate to have been Gotcha’d through social media and into Brian’s home. And I know you are very thankful and such a good kitty. Enjoy your Gotcha Day. Dolly, you sweet girl. Happy Gotcha Day! Jenna is truly amazing to not have given up rescuing you. That’s a true hero. Sister Dolly we are so glad that you had a happily ever after and we celebrate today along with you on your bestest Gotcha Day!!! loved reading about your rescue sweetie!! and you are right about why sharing tweets is so important!! Happy Gotcha Day, Dolly. I love your photo. It’s very pretty. Happy Gotcha Day, Dolly! We’re so glad you are part of such a wonderful family. Happy Gotcha Day, sweet Dolly! We are so glad that news of you reached your Forever Family! Pretty Dolly, wishing you a very happy Gotcha Day! I am so sorry that your previous humans mistreated you so, but you’ve got the bestest ones in the world now! Happy Gotcha Day. You are your parents saved one another. I like your Gotcha Day story. That’s a fabulous and complicated story, i am so glad you were got! I always read your story. Social media is an important tool in saving cats. Now there are more avenues than ever. Oh and Happy Gotcha Day! Happy gotcha day, Dolly! I do post cats in need on Twitter, continuing in Sparkle’s pawsteps. Happy Gotcha Day, Sister Dolly! Purrs and hugs! Happy Gotcha Day Sister Dolly! And we love your Halloween scratcher, it’s epic! I hope you had a wonderful Gotcha Day! That’s wonderful that social media helped you find your forever home! Happy Gotcher Day sweet lady, and boy are WE glad you got found. Jenna is an angel with grit and determination isn’t she 🙂 You are the loveliest cat ever. Happy gotcha day, Dolly! YOu sure did find a purrfect happily ever after!